At Denex®, we sincerely believe consistent quality is a cognizant effort which can only be achieved by sensitive and systematic approach of both heart and mind respectively. 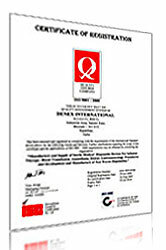 Selective reputed raw material suppliers from all around the world gives our product an edge over its competitors, giving the best combination of selected components from all around the world. Testing facility at works enables us perform comprehensive tests at various stages during process and at finished product stage thus giving us a satisfaction of supplying a quality assured products to the people who trust and believe in us. 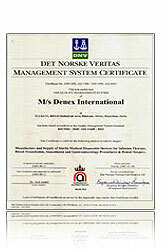 Denex International, have been successfully able to implement & document quality management system (QMS) which has been certified ISO9001:2008 by International Standards Certifications (ISC) Pty. 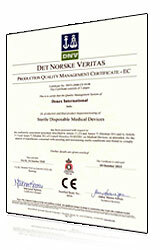 Ltd. accredited by JAS-ANZ and also ISO13485:2003 by DNV Norway, Our total range of disposables is CE certified by DNV, Norway.